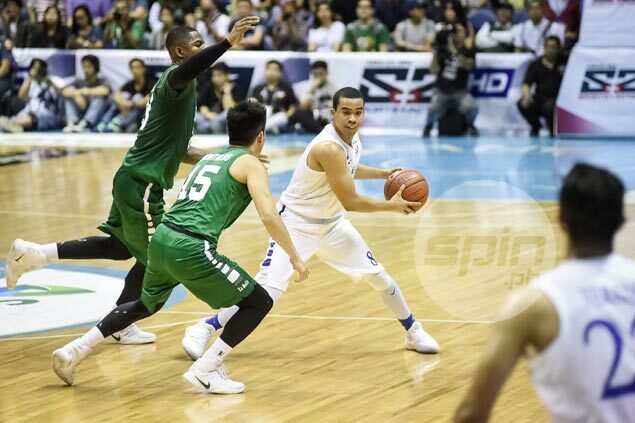 THE Ateneo Blue Eagles did the unthinkable last Saturday when they ended the 12-game unbeaten run of the La Salle Green Archers with an 83-71 victory at the Smart Araneta Coliseum. The Green Archers have been dominating the UAAP Season 79 basketball tournament, blowing out the competition to a 12-0 start. But the Blue Eagles, thanks to their impeccable execution on both ends of the floor, were able to hold their ground as they took down their mighty archrivals. Leading the way for the men in blue and white was Aaron Black, who notched 16 points on 7-of-10 shooting and seven rebounds. “I just came into the mentality that I really want to win this game. Always be attacking,” Black said after Ateneo’s gutsy win. For his stellar performance, the third year shooting guard was named the ACCEL Quantum/3XVI-UAAP Press Corps Player of the Week. Saturday’s contest also turned out to be Black’s best outing since coming from a left foot injury last September. He was out for a month and missed a total of five games for the Eagles. Since his return however, Black has been an instrumental part of his team’s offense. He is currently averaging 9.3 points a game, along with 4.2 rebounds and 2.2 assists. Black bested University of the Philippines’ Paul Desiderio, Adamson’s Sean Manganti, and National University’s Matt Salem, all of which had noteworthy performances for their respective teams over the weekend, for the league’s weekly award. Ateneo’s win earned them a chance to still qualify for the coveted twice-to-beat advantage. The Blue Eagles stand at 7-4, currently in third place behind the Far Eastern University Tamaraws.